Perfectly Pinned Up and Rims on the River are joining forces AGAIN to bring you 3rd Annual Perfect Pinup Wilmington! Join us Saturday, May 18, 2019 from 11a-5p for a day of classic cars, hot rods, loads of vendors, music and pinup girls! 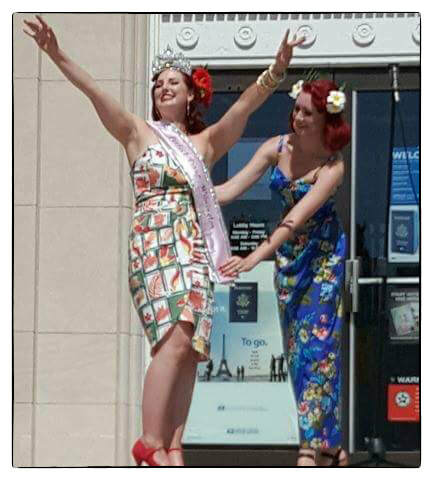 Are you interested in participating in the Pinup contest? *Simply download and complete the Perfect Pinup Wilmington Application and email it to PerfectlyPinnedUp@gmail.com! Only 10 contestants will be selected, so don't delay! *By submitting your application, you are confirming that you have read all the rules below. Unique Trophies — designed by BrittanyJean and created by a wounded Veteran — will be awarded to 1st, 2nd and 3rd place, as well as Best Hair, Best Wardrobe, and Best Pose. More prizes TBA!! EVERY contestant will receive a gift bag, just for participating! **Check back soon for more prizes and details! A pinup's job is not complete unless she is doing something to better her community. Just as the real pinups provided support for our servicemen in various ways, it's my personal belief that this should still hold true today. A booth will be set up with 10 collection jars (one for each contestant) to collect donations at the booth. For every dollar, one vote will be given to that contestant. The contestant who raises the most funds will receive extra points on her total score from the judges and social media points. No money raised will be shared with any contestant, myself, or anyone involved — it all will go 100% to N.C. Disaster Relief Fund. Additionally, there is no limit on how many votes a person may purchase. Contestants may also purchase votes for themselves. Entrants must be 18 or older to participate in Perfect Pinup Wilmington. Be Involved. Once your entry is accepted and announced, it is expected that you will promote your involvement in the contest with the graphics created for the event. Be present. Contestants must be available on the day of the event, for the entirety of the event. Please report to the Perfectly Pinned Up booth and check in no later than noon. Appropriate attire is required. All outfits for the contest must be approved prior to the event. Once approved, you may not change your outfit or show up in something else. Remember, this is a family-friendly event. Swearing, drinking, or any suggestive behavior will result in disqualification. We are women who uplift each other. Any negative behavior or any bashing towards other contestants by you or your entourage will result in disqualification. Smile, have fun, and remember why you are here! You were CHOSEN to be a part of this contest, and you will get all day to shine, be glamorous, meet lots of other people, and help out a wonderful organization. Are you interested in supporting this contest? I would love to hear from you! Sponsorship packages are available for your consideration. Let your brand show support for the N.C. Disaster Relief Fund, and the ladies who will be working very hard to raise money for our Nation's Heroes! Contact PerfectlyPinnedUp@gmail.com to receive the sponsorship form.